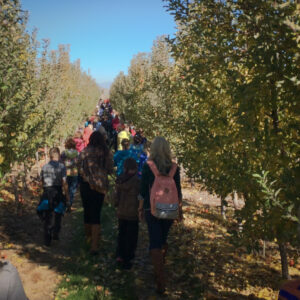 Our elementary school tours are an interactive, hands-on experience that looks at, among other things, the importance of water and water conservation, how we plant new orchards, how we protect blossoms from cold spring temperatures, the importance of bees and pollination, regular orchard maintenance, harvesting, the importance of eating fresh and learning where their food comes from. We will also include resources to tie the Utah core curriculum to items that will be discussed in the tour. We will provide an activity booklet for the children to fill out as part of the tour so that they may better remember the items discussed. 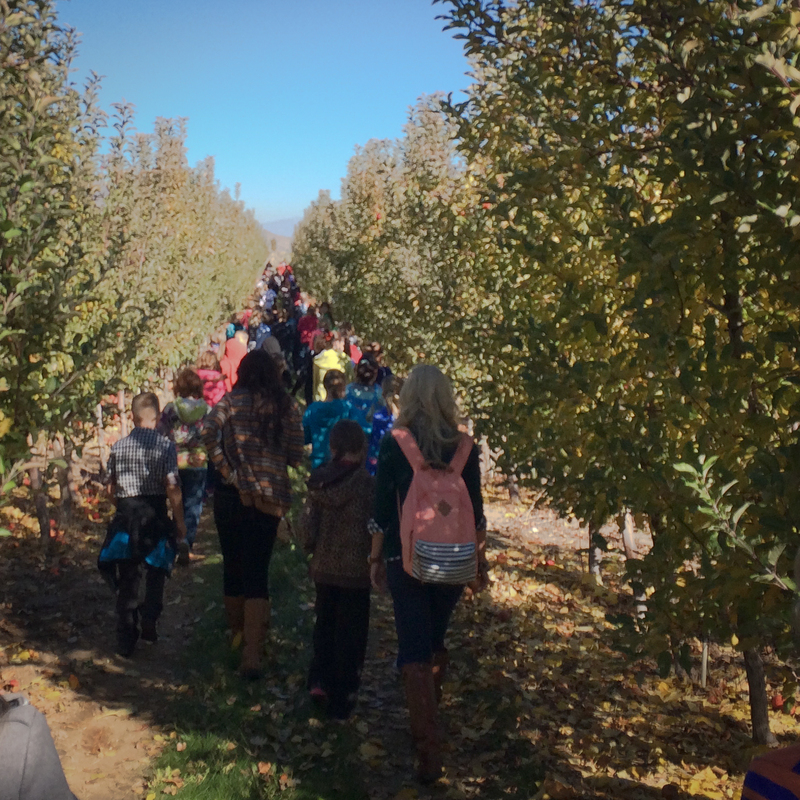 Our educational tours will begin on the September 17, 2018 with a few select dates in October where we can ensure that there is fruit available for the children to harvest as part of the tour. Harvests are usually completed by October so earlier groups will have a better tour experience and selection. Plan on spending two hours at our location. The educational portion will last between 45 minutes to 1 hour. The mode of transportation once on the farm will be by tractor pulled wagon. There will be 3 educational stops along the tour, with the last stop ending at the “Back Forty”, where you will then have access to the pumpkin patch activities for up to 45 minutes of free time. If your school brings lunches, there is a pavilion at the pumpkin patch where your students will be able to eat during this free time. A fresh apple cider doughnut. An apple or peach (the students will pick this on the tour). A free pass to return in October and enjoy our Pumpkin Patch activities (value of $8). Additionally, each class can harvest one pumpkin per class to display in their classroom as a reminder of their time on our farm. *Please note that the entire tour is outdoors. Make sure your class dresses for the often cold and sometimes wet fall weather. Students will gain an understanding of Life Science through the study of changes in organisms over time and the nature of living things. Describe and practice responsible behaviors for health and safety. Describe the benefits of eating a variety of nutritious foods. Describe the benefits of physical activity. Students will develop a sense of self. Describe and adopt behaviors for health and safety. Explain the importance of balance in a diet. Compare personal eating habits with a balanced diet. Evaluate personal activity level and food intake with the Dietary Guidelines for Americans and plan ways to improve health. Students will understand that microorganisms range from simple to complex, are found almost everywhere, and are both helpful and harmful. Identify positive and negative effects of microorganisms and how science has developed positive uses for some microorganisms and overcome the negative effects of others. Describe in writing how microorganisms serve as decomposers in the environment. Identify how microorganisms are used as food or in the production of food (e.g., yeast helps bread rise, fungi flavor cheese, algae are used in ice cream, bacteria are used to make cheese and yogurt). Relate several diseases caused by microorganisms to the organism causing the disease (e.g., athlete’s foot -fungi, streptococcus throat -bacteria, giardia -protozoa). Observe and report on microorganisms’ harmful effects on food (e.g., causes fruits and vegetables to rot, destroys food bearing plants, makes milk sour). Evaluate food intake and levels of activity. Explain nutritional labeling and identify nutritional content.